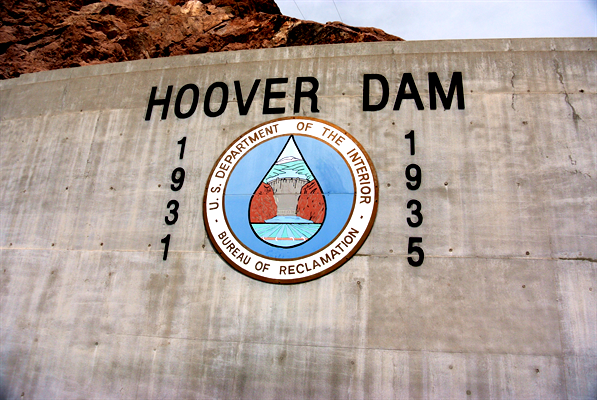 Originally called Boulder Dam, Hoover Dam is a marvel. I had put touring this dam on my bucket list many years ago and finally took the time on this trip. As an added bonus the Mike O’Callaghan-Pat Tillman Bridge is a sight to behold just past the spillway. Both are engineering marvels that have huge economic impact. 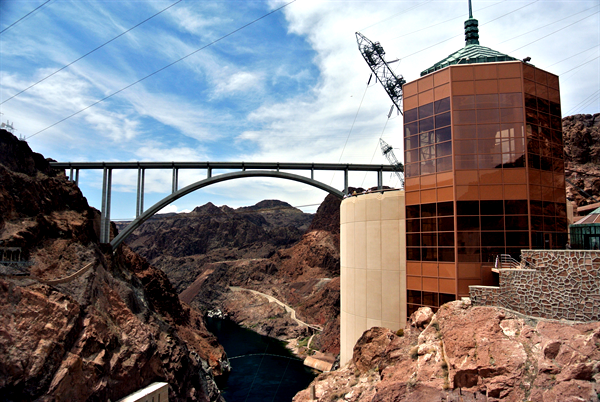 The scale of Hoover Dam and the bridge are awesome. The amount of electricity generated and the amount of arable land created by the dam is awesome. 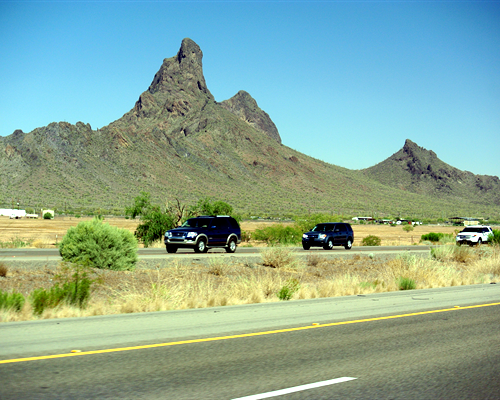 The bridge provides a much improved traffic route for both goods and people traveling to and from Las Vegas. Built before WWII the size of this dam and its impoundment required new construction methods such as installing cooling pipes so that the concrete could cure properly and building it with huge Lego like blocks. Four and one half million cubic yards of concrete, 726 feet tall, and 1,244 feet long it is immense. This concrete and steel composite arch bridge spans the 1060 ft gorge 900 ft above the Colorado river. Though not quite the longest or tallest bridge it is certainly impressive. 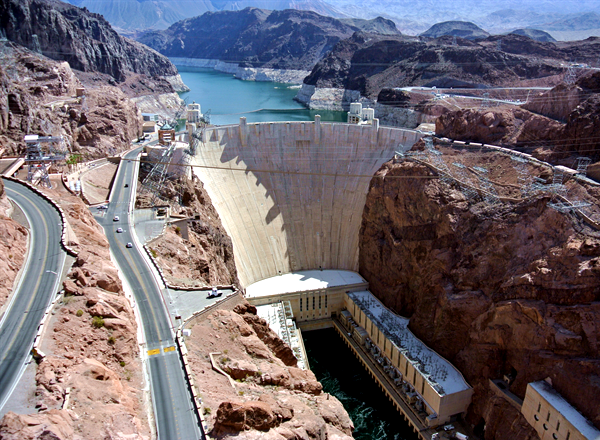 Check out the web or better yet visit Hoover Dam yourself to find out even more. You won’t be sorry. 5/21/2014 and we are on our way! The first stop, breakfast at the Vail Steakhouse a regular stop for us where the food is always good and it is on our way to many destinations. 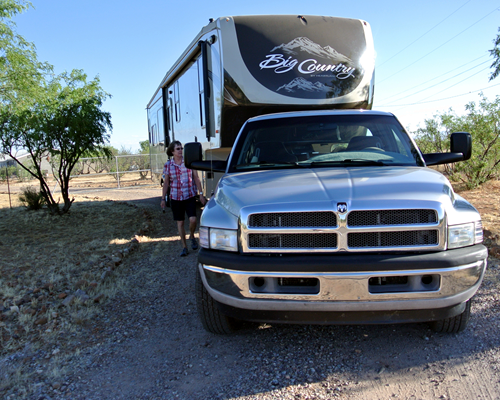 Today’s objective, Leaf Verde RV in Buckeye, AZ. Maybe not very far by some people’s standards but far enough for us. Unfortunately we had a tire blowout on Bertha but all is well. Got roadside assistance and a new tire. No damage! I check pressure and we keep our speed below 65 mph religiously but sometimes that is not enough. 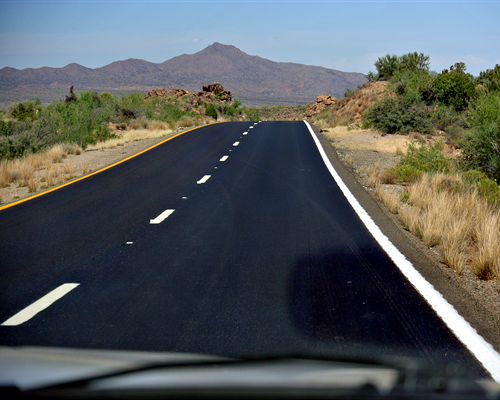 Leaf Verde is a clean, easy, safe stop over with a friendly staff. Heading out in the morning for Boulder City, NV. 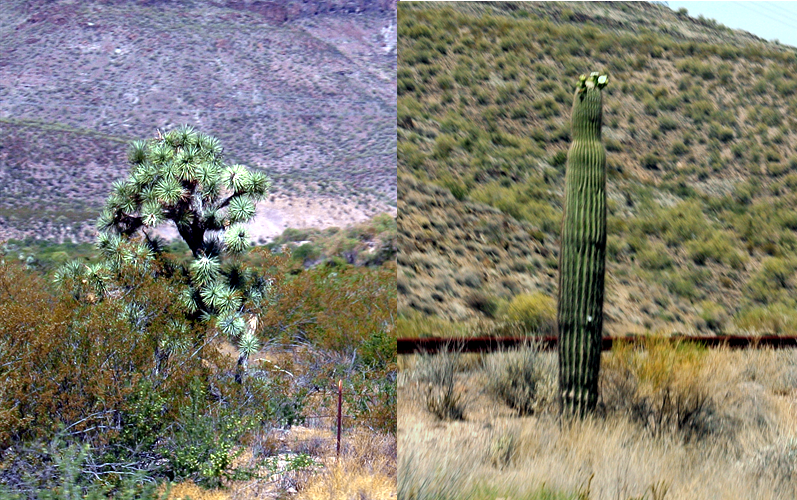 There were also Iron Wood, Mesquite, and Palo Verde trees all along the way with a quick glimpse of Hoover Dam just before we reached the Elks Lodge at Boulder City our resting place for two nights. I will post a few pictures and comments from our day at Hoover Dam separately. We could not have felt more welcome. 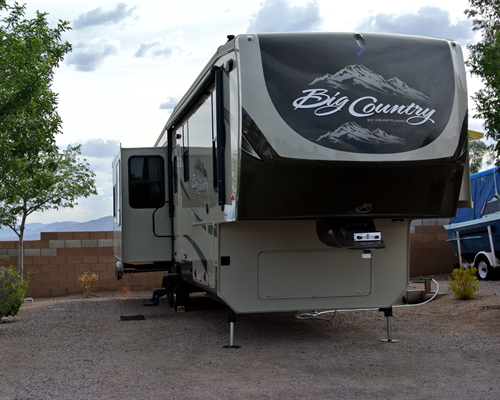 The RV facilities and lodge at Boulder City were great. It was a great location for exploring “The City That The Dam Builders Created” and Hoover Dam itself. We thoroughly enjoyed “Taco Night” (complete Mexican meals available – rice, beans, enchiladas, burritos, salads, chimichangas, rellenos, etc.) and met some real nice folks. 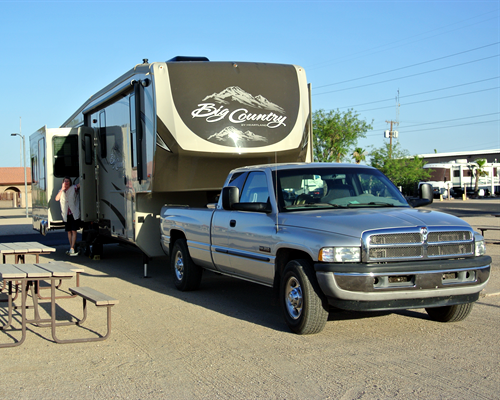 From here we will travel north to Beaver and Roy, UT then on to Pocatello, ID, Deer Lodge, MT and finally to Heyburn State Park in Idaho. We are both getting antsy as the appointed roll out time draws near. We have an exciting summer planned with large portion of our time being near our Spokane family. Should be great fun seeing them all especially watching our grands performing sports and dance. For months we have been planning and discussing. For weeks we have been getting ready. So much to do. Doctors, dentists, prescriptions, reduce the frozen food supply, finish up the modifications we decided on, make repairs on the homestead, clean out the garden, pack food, clothes, computers, camera, tools and the DVR, and finally check the check lists and do whatever we forgot. We’ve had lots of practice shutting down the homestead and setting up shop in Bertha so I know we will get it all done. As part of a project to reduce electrical load while boon-docking that included replacing all the existing halogen and incandescent 12 volt lamps with LED’s I added a string of lights to Bertha’s underside because I thought they would look pretty cool and I had heard that they would deter rodents. I wired them into the existing step light circuit so that one switch turn it all on/off. I also added a 12 volt dusk to dawn control so that I can just leave it on all the time unless I really feel the need to conserve. All the lights together only draw 0.71 amps! (The original step light drew twice that much power all by itself.) 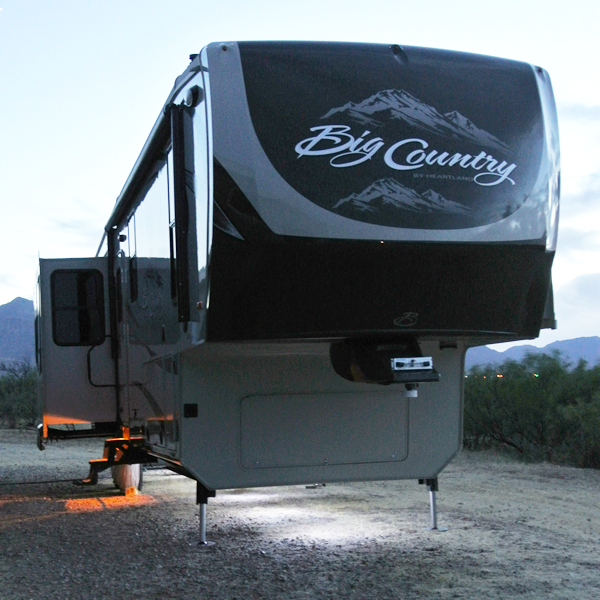 The rest of the project included moving the two basement lights from the wall to overhead and re-wiring the front compartment light so that it is now controlled with the switch for the hitch light. Now I can see when I have left the light on (because the hitch light is also on) and I can turn the light on without reaching into that dark space. Shopping at Camping World we saw a spice rack that we thought might work. The long and short of it was that it did not utilize the space well and I did not think it would last considering the load we would be putting on it. So I made these two racks using the clips from the kits we had purchased. 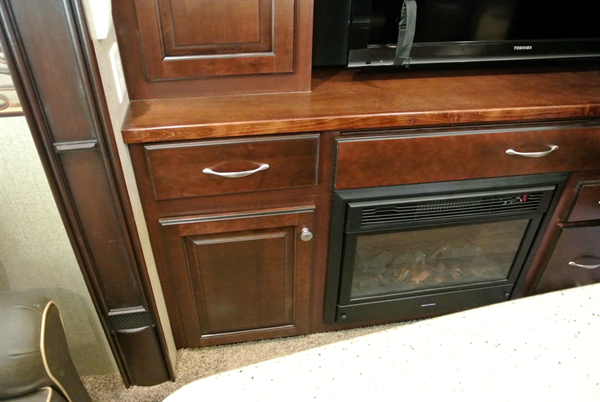 They are supported by full extension pull out drawer guides in an under-mount orientation with simple wood tracks at the top. 56 herbs and spices in a very small space! That is probably more seasonings than we really need but with two cooks each of whom have their “gotta haves” it takes a few more. When we bought Bertha she had this very strange open space next to the desk that we never did figure out a good use for so we ordered a drawer front and I made a drawer to fit the hole. Now it looks like it belongs and is useful. We added a few more places to keep items handy but out-of-the-way. There are now some hanging bins behind the sink, places to put magazines and books for night-time reading right over the bed, and some shoe “cubbies” at the foot of the bed. In the basement and front storage I mounted wire baskets, and more hooks and clips to help keep most of the paraphernalia accessible. After much thought we moved the table slightly. 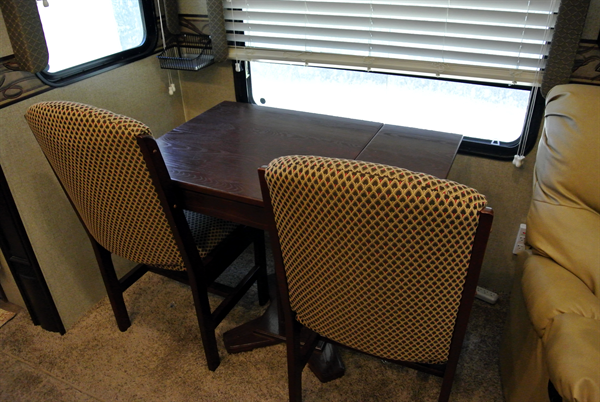 It won’t be as convenient when we have dinner guests but will give us more room and a better view most of the time. I was not happy with the stock over the air antenna on Bertha. It seemed like we could not get as much broadcast TV as our neighbors were getting so I replaced it with a King Controls “Jack”. 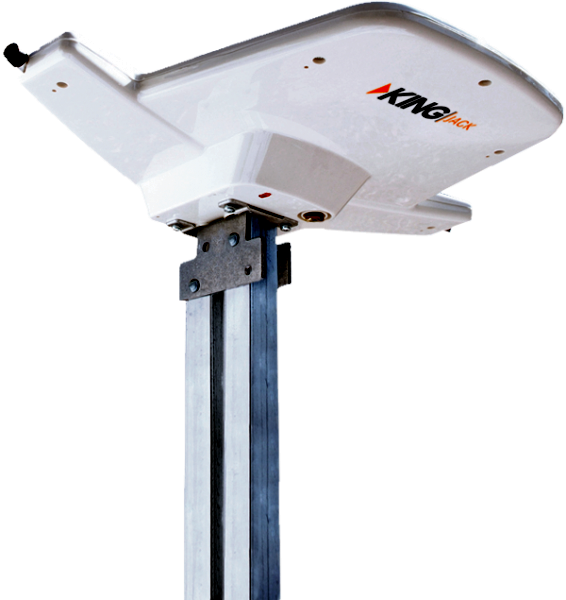 It is an exact fit on the existing Antenna Tec “Signal Commander” mast. Very easy and the new antenna is certainly efficacious!